A3 Size 10.7 x 13.9 in. (272 x 352 mm.) 11.7 x 16.5 in. MEDIUM 14.25 x 18.5 in. (362 x 470 mm) 18 x 24 in. In Hindu mythology Kubera is a wealth-god and the king of the yaksha spirits, who originally ruled over the kingdom of Sri Lanka before his demonic stepbrother, Ravana, overthrew him. Kubera then took up residence in the northern city of Alakapuri, which is located in the Himalayas near Mount Kailash. As the Lord of the Yakshas and ruler of the North, Kubera was later assimilated into the Indian Buddhist tradition and identified with the wealth deities Jambhala and Vaishravana. Jambhala (Tib. Dzambhala) often appears in a similar dwarf-like yellow or red form to Kubera, and his principal attributes are a citron fruit and a mongoose. Vaishravana (Tib. Namthosa), the ‘Son of Vishravas’, was also identified with Kubera in Hindu mythology, but in Buddhism he appears in various forms as a wealth-deity and as one of the ‘Four Great Kings’, who rules over the Yakshas and the Northern face of Mount Meru. The name Kubera or Kuvera essentially means the ‘misshaped one’, which alludes to his corpulent and dwarf-like appearance. Kubera or Jambhala is traditionally yellowish-red in colour, with a strong corpulent body and potbelly, a moustache, two round and piercing eyes, and a somewhat stern and regal expression. He sits in a posture of royal-ease upon a white moon disc that rests upon the seed-head of an open lotus, with his left leg drawn up and his right leg slightly extended. His lower garments are made from embroidered silk, a silk sash is looped around his chest, a long silk scarf billows around his shoulders and upper body, and a blue naga-serpent loops around his chest as a sacred thread. As a wealth-god Kubera wears the richly jeweled ornaments of gold and pearl bracelets and armlets; ornate anklets; jeweled earrings; an elaborate gold and silver neck choker with loops of pearls, gold and gemstones; a chained necklace, and an ornate belt with hanging loops of gemstones and a central buckle. His five-jeweled crown is adorned with hanging loops of pearls and small victory flags. His long black hair is bound up into a topknot crowned with a half-vajra, with loosened strands hang freely about his shoulders. With his lowered right hand Kubera makes the boon-granting varada-mudra of generosity as he holds a radiant blue wish-granting gem. While with his left hand he cradles a jewel-bedecked ‘treasure mongoose’, along with a pile of small gemstones that the mongoose has disgorged. 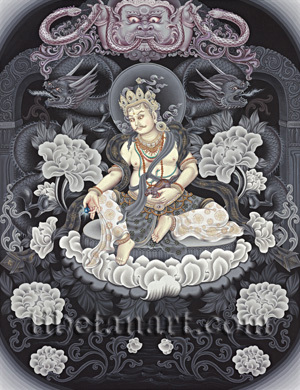 Kubera’s lotus-seat arises from the dark waters of a lotus-lake, where stylized stems bear a profusion of white lotus blossoms and buds that surround his form. From behind these lotuses appear the symmetrical, writhing and auspicious forms of two ascending dragons, which each clasp wish-granting gemstones with their sharp claws. The dragons have fierce faces, long horns, piercing eyes, sharp teeth and fangs, and emit streams of fire from their open mouths. Behind the dragons are two symmetrical pillars that support a trefoil arch decorated with scrolling motifs, with the large fierce head and hands of Chepu or Kirtimukha crowning its top. In Hindu mythology Kirtimukha, meaning the ‘Face of Glory’, was the elder brother of Garuda, who was born half-formed from an egg that his mother broke open in desperation after she had incubated it for five-hundred years. However, the full-term for Chepu’s egg to hatch was a thousand years, so Chepu was born prematurely with only his ferocious head, arms and hands fully formed. Like Garuda he is a sworn enemy of the naga-serpents, two of which he is shown devouring with his voracious mouth. On the outer frame of this painting are the artist Amrit Dangol’s name and a Ranjana inscription (not shown) of taking refuge in Kubera, which reads, Sri Nama Kubera Sharanam.